don't ya wish your girlfriend was smart like me? : R.E.M. 's Michael Stipe "Outs" His Bandmates as "Heterosexual"
R.E.M. 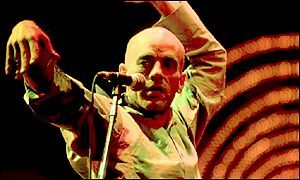 's Michael Stipe "Outs" His Bandmates as "Heterosexual"
This is brilliant, and nothing less than I would expect from Stipe and R.E.M., who recently stated he's a "queer artist." This seems to me to be a response to his frustration over needing to "come out"; his lack of doing so had been read as "cowardly" rather than about one's sexual and intimate life being irrelevant and no one's damn business. The coming-out parody that he performs is not with the point of criticizing "coming out," which for may queers is an important act, especially considering the history of queer invisibility. Rather, this parody reveals culture as heteronormative in that heterosexuality is assumed unless said otherwise and unless marked properly. It operates in a similar fashion that following up the question, "When did you first realize you were gay?" with "When did you first realize you were straight?" does. This was especially evident in the J.K. Rowling/Dumbledore is gay incident this past fall. The announcement upset people because his sexual identity as gay was not made explicit in the text. Rowling's after-the-fact "revelation" of Dumbledore's sexuality operated less like a "coming out." Instead it underscored the cultural assumption of heterosexuality as the "default" sexuality, showing it to be normalized and exnominated. The personal lives of the book's adult characters were almost never discussed, yet this only became an issue because Dumbledore happened to be gay and therefore his personal life became of the utmost importance in making sense of his character. In the books, there was no lover, no obsession with musical theatre, no use of the word "fabulous!" I'm exaggerating of course, but what I'm indicating is that there was no overt way that the text produced him as gay. There was also no "coming out" moment in the text and he was not introduced as "gay" in the character's initial introduction (to the dismay of some gay activists). Of course, after the "revelation" people went through the texts and tried to re-read his character, with this "truth" in mind, and could thus "produce" him as gay. If that isn't an example of imposing a system of interpretation onto bodily acts that produce and understanding of gender and sexual identity, I don't know what does. This complusion to know and distinguish genders and sexualities by making meaning of bodily acts really reflects back onto heteronormative culture and how fragile and vulnerable its own construction is. This isn't to deny the value of "coming out"-clearly visibility of queer individuals as successful and caring people, present in every aspect of society is part of what is needed to disrupt social stigmas and assumptions. But I also think what Stipe is doing here is important too, and provokes a much-needed conversation about recent centrality and importance of sexuality to/as individual identity.